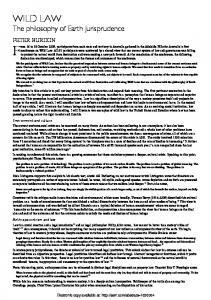 research in US law schools, these scholars warn against an unduly simplistic ...... and Obligations in Social Welfare Historyâ, Brooklyn Law Review, 56, pp. year 2000 United States census identified one-third of the nation's population ... 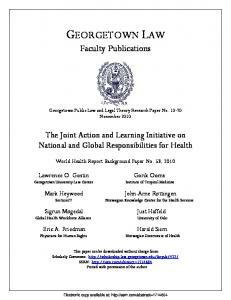 The Clinical Legal Education Association, in its report, Best Practices for Legal. literally be at stake, this is no small matter. ... the other, âas though history or economics or philosophy, say, should pass a plate ..... In this case, the trial court had. insisting that we study the process of interdisciplinary translation itself. The disciplines that have paid systematic attention to this issue of translation range from anthropological linguistics and sociolinguistics through law and literature. Thus this volume itself epitomizes a new kind of translation among disparate traditions, drawing together scholarly approaches that are often tempted into talking past one another. However, as we will see, they are often working at a similar intersection and can together contribute to a more rigorous and informed understanding of what is happening when social science is used in legal decisions. The sections of this Introduction mirror the organization of the volume [The Role of Social Science in Law (2008)], providing an explanation of the logic of each part of the book in turn. The essays reprinted in this collection represent, of necessity, only a small slice of the wide array of important relevant research. As far as possible, I have sought to remedy this by featuring additional essays and books throughout this Introduction. (However, this remedy is obviously partial; I cite a number of excellent review essays within this Introduction, which I recommend to those interested in a broader array of readings.) Each section of the volume concludes with a specific example of how translation issues play out „on the ground‟. This emphasis on examining translation in practice is a theme for interdisciplinary scholars interested in a „new legal realism‟. At a time when there is renewed interest in empirical research in US law schools, these scholars warn against an unduly simplistic approach to bridging important differences between law and social science. Ignoring these differences will lead to serious analytical mistakes, in which social science findings may be used improperly to bolster the wrong conclusions. In the arenas addressed by law, where life and death may literally be at stake, this is no small matter. out results as a log chipper spits out wood chips‟ (p. 15). But these methods are not simply technologies; they emerge from a wider set of disciplinary practices that include learning how to frame questions, what sorts of questions are appropriately addressed in certain ways, where the limits of certainty lie, and so forth. Sociologists who use quantitative methods do not limit their training to statistics; instead, they engage in coursework, research, and writing that teaches them the contexts for using statistics. Both of these models discussed by White put very light loads on the would-be translator – either to pick up neatly-packaged findings or to learn a new technology. Let‟s think about these examples as if we were talking about learning a language in the traditional sense – say, a speaker of Gaelic learning to speak English. Under the „findings‟ model, it is as if we were telling that person that he could simply pick out English words from a dictionary and use them to speak, without ever teaching him grammar. The „intellectual method‟ approach, on the other hand, might insist that he learn the grammar without much practice in actually using the language – and certainly without any immersion in a setting where the language was in everyday use. He might come out of that training able to speak in a stilted way, but he would certainly be making many mistakes in the process. If our awkward speaker were then put in a powerful position, the results could be disastrous. Imagine, for example, that you were on trial in a Gaelic-only courtroom, and this fellow was taken quite seriously as an able English-speaker. You might find yourself in jail on the basis of a mistranslated idiom. (And lest this comparison seem too frivolous, imagine now that a legal scholar who doesn‟t fully grasp the tentative character of social science findings on the death penalty translates them with a misplaced certainty – and then has a powerful impact on actual legal policy.) In place of the „findings‟ and „intellectual method‟ models, White urges that we work to achieve a more rigorous form of interdisciplinary translation – one with more integrity. He urges that we think of translation not as one discipline using or absorbing another, but as two different discourses that come together in such a way as to make a third, different discourse – blending both to make a new „composition‟. The downside to this is that it takes much more work, requiring scholars to achieve a higher level of comprehension of the discipline to be translated. The upside is that it might result in something that does better justice to both of the disciplinary perspectives involved. In Chapter 2 John Monahan and Laurens Walker discuss three ways in which US courts have attempted to translate social science. 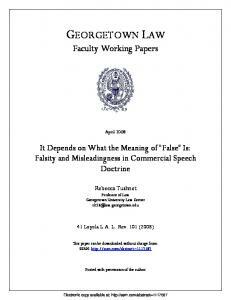 To distinguish among these three approaches, the authors draw upon the familiar legal categories of „fact‟ and „law‟ (thereby themselves performing a deft act of translation into legal categories). Thus, they argue, courts have drawn on social science to make law, to determine facts, and to provide context (a fact/law mixture). Since 1908 the US Supreme Court has accepted briefs that rely on social science evidence, and in subsequent decades „research has frequently been invoked by courts to demonstrate the validity of empirical assumptions made in the process of modifying existing law or creating new law‟ (p. 25). A famous example of this was the original brief by Louis Brandeis presenting research that indicated deleterious effects on women from working long hours (Muller v. Oregon, 1908). Another well-known turning-point was the Supreme Court‟s reliance, in Brown v. Board of Education, on social science that pointed to harmful psychological effects of segregation on black children. In this kind of case, then, the courts turned to social science for help in making decisions about the broad social and psychological truths assumed in legal doctrines. A somewhat different use of social science in court decisions has centered on case-specific questions. For example, in trademark cases, courts are frequently called on to decide whether a new trademark may cause confusion because it resembles an already established trademark. They have turned to empirical studies by social scientists to help them determine whether a particular trademark does in fact seem to confuse people. last danger of which Ellsworth warns: that the death penalty policy in the United States has been (and may continue to be) based on a hasty acceptance of flawed social science. Dismissing well-founded research is not the only risk that follows from the myth of transparent translation. Legal scholars may also too readily accept, as settled propositions, conclusions that are up for debate within a field. Deciphering field-specific nuances regarding the questionable nature of certain findings is another task that is ill-suited to scholars trained in a discipline centered on advocacy. This is particularly the case when the stakes are high – when the state‟s decision to imprison or kill its citizens hangs in the balance. Asking that we reach conclusions that are „beyond a reasonable doubt‟ is surely good policy at all levels in these cases. Donohue and Wolfers demonstrate that there is quite a lot of doubt surrounding empirical research purporting to show that the death penalty deters crime. They express concern about „the potential dangers awaiting those who might wish to short-circuit the full process of scientific inquiry and validation and rush directly to the legislative forum …‟ (p. 93). In a more optimistic vein, in Chapter 4 Michael Radelet and Marian Borg trace the impact of social science on public opinion, arguing that, over time, firmly-grounded social science is having an effect on public perceptions. They provide a thorough overview of the intersection between social science and law as regards the death penalty in the United States, reviewing arguments over deterrence, incapacitation, caprice and bias, cost, miscarriages of justice, and retribution. 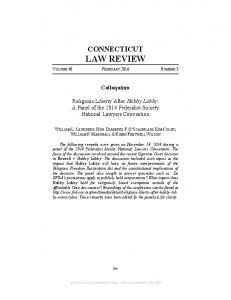 When we compare their discussion with that of Donohue and Wolfers, we see a continuing pattern in which policy concerns have distorted the legal reception of relevant research; many of the themes in the more recent debate can be traced back through earlier discussions summarized by Radelet and Borg. In their discussion of miscarriages of justice, the authors also introduce the Capital Jury Project, an ongoing program of research examining the decision-making of capital jurors. In the final essay of the section, David Baldus (Chapter 5) focuses on the Capital Jury Project as a potential bridge between social science and legal discourses, and continues Radelet and Borg‟s optimism about the eventual impact of social science, not only on the public but also on the judiciary. As a key participant in the ongoing dialogue between the Supreme Court and the research community, Baldus brings us closer to the back-and-forth, highlighting the contrasting understandings of the legal and social science communities as they struggled to bridge a gap in translation. Together, these last two essays introduce many of the major voices and positions on both sides of this gap. The thoughtful work in this area poses some stark questions about the use of social science in legal decision-making. It pushes us to ask what further steps are needed to develop a more effective process of translation and reminds us of what is at stake. Nevertheless, of course, translation issues reach beyond the bounds of law and social science to the wider society as well (Sarat, 2001). 2. Translating Social Science in Legal Settings In Part II the book begins to focus more specifically on some particular aspects of legal and social science discourses that complicate efforts to translate between them. In Part III of the volume, we turn to examine in more detail the impact of institutional and social contexts on translation between law and social science, and we see that translation occurs across a variety of contexts, reaching far beyond appellate opinions. As we move into this broader context, we must confront some of the institutional and professional issues involved in the translation process (Brigham and Harrington, 1989). These kinds of issues arise both in law and in social science. science ironically rob it of objectivity. When more novel social science approaches come into internal conflict with the dominant approaches in their field, Römkens argues that the law is skewed in favour of the approach with the most conservatively formulated, institutionally powerful foundation. On the other hand, in the case she analyses, she finds that the court does manage to incorporate some of the insights generated by a newer social scientific perspective – albeit with considerable ambivalence. This permits the court to balance a traditional maledominated perspective with an approach that does better justice to some aspects of women‟s lives. The possibility that courts and judges can take a cutting-edge role in resisting traditional views of gender roles becomes even clearer in Justice Williams‟s essay (Chapter 18). Here, however, instead of taking the lead in accepting new forms of legitimate social science, Williams argues against the use of a created „syndrome‟ that actually plays on old prejudices against women. Use of this stereotype may have actually the perverse effect of silencing children and women who report child sexual abuse, particularly at the time of divorce. Williams is also here rejecting a US import, which he fears will have a negative effect on Canadian decisions in child custody cases. No book on social science in law would be complete without including the voice of a legal actor charged with performing this translation task. Here we have a fresh, urgent perspective from „the trenches‟. Together, Williams and Römkens challenge us to think about the complicated interface of institutional, social and professional influences on the translation of social science in legal settings. genocide in Darfur uncovered by their analysis with the UN Commission of Inquiry on Darfur‟s denial that genocide has occurred. They give us a detailed description of how legal evidentiary burdens might affect the reception of social science evidence, but conclude with suggestions as to how an effective translation might be attained. Wendy Espeland‟s essay on the Yavapai struggle to retain their land (Chapter 23) is, for the most part, a tale of the failure of legal translation. Espeland describes an ongoing battle over Yavapai water rights – a struggle which culminated in an eventual confrontation between the rational decision framework used by the US Bureau of Reclamation (a framework heavily steeped in techniques of commensuration) and the Yavapai‟s own conception of the significance of their land and history. When the categories and options proferred by the government failed to do justice to this conception, the Yavapai went outside the channels provided by law, turning to political discourse and the public media. Espeland challenges us to think about the limits of translation – about times when it might be necessary to abandon a conversation with law in favour of other avenues for struggle. Like Espeland, Jacqueline Urla (Chapter 24) provides a telling example of the non-neutral character of seemingly „objective‟ technologies like surveys and statistics. In a fascinating counterpoint to the tale of the Yavapai, Basque speakers have turned the commensuration machinery of the contemporary bureaucratic state to their advantage: „In turning language into countable things, militants and moderates have found an authoritative means of documenting Basque cultural and linguistic marginalization and of managing competing language rights‟ (p. 593). Of course, this does not come without a price attached – the dramatic alternation of previously uncountable aspects of people‟s identity. Yet Urla stresses the double-edge of this conversion, analysing this appropriation as a form of resistance. 4 We see in these essays the inevitably political context that awaits social science translations in legal and other governmental settings. Leaving this context unanalysed, as Römkens previously observed, ironically guarantees that legal attempts at objectivity will be rendered less objective. This irony points us towards the necessity of combining critical perspectives with empirical research when we are studying the translation of social science in law. knowledge. Translation of this kind will inevitably, as we noted at the outset, involve transformation and, indeed, loss. But it is possible to move forward with some care, developing more systematic analyses not only of the kinds of losses and transformations involved, but also of the gains to be had from a more informed and critical conversation. The Role of Social Science in Law References Brigham, John and Harrington, Christine (1989), „Realism and Its Consequences: An Inquiry into Contemporary Sociological Research‟, International Journal of the Sociology of Law, 17, pp. 41– 62. Ellsworth, Phoebe (1988), „Unpleasant Facts: The Supreme Court‟s Response to Empirical Research on Capital Punishment‟, in Kenneth Haas and James Inciardi (eds), Challenging Capital Punishment: Legal and Social Science Approaches, London: Sage, pp. 177–211. Epstein, Lee and King, Gary (2002), „The Rules of Inference‟, University of Chicago Law Review, 69, pp. 1–133. 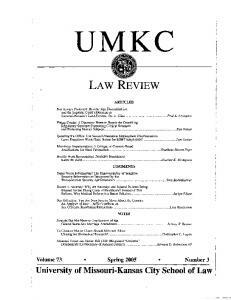 Erlanger, Howard, Garth, Bryant, Larson, Jane, Mertz, Elizabeth, Nourse, Victoria and Wilkins, David (2005), „Introduction: New Legal Realist Methods‟, Wisconsin Law Review, pp. 335–63. Fineman, Martha (1991), The Illusion of Equality: The Rhetoric and Reality of Divorce Reform, Chicago: University of Chicago Press. Fineman, Martha (1995), The Neutered Mother, The Sexual Family, and Other Twentieth Century Tragedies, New York: Routledge. Garth, Bryant and Sterling, Joyce (1998), „From Legal Realism to Law and Society: Reshaping Law for the Last Stages of the Social Activist State‟, Law & Society Review, 32, pp. 409–71. Gooding, Susan Staiger (1994), „Place, Race, Names: Layered Identities in United States v. Oregon, Confederated Tribes of the Colville Reservation, Plaintiff-Intervenor‟, Law & Society Review, 28, pp. 1181–230. 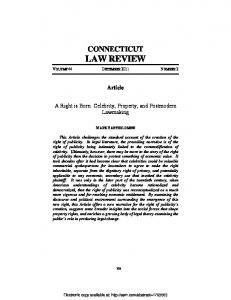 Handler, Joel (1990), „“Constructing the Political Spectacle”: Interpretation of Entitlements, Legalization, and Obligations in Social Welfare History‟, Brooklyn Law Review, 56, pp. 899–974. Lempert, Richard and Joseph Sanders (1989), An Invitation to Law and Social Science: Deserts, Disputes, and Distri bution, Philadelphia, PA: University of Pennsylvania Press. 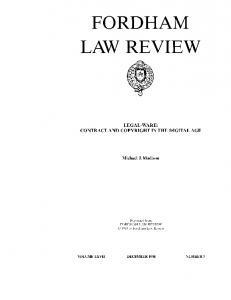 Macaulay, Stewart, Friedman, Lawrence and Stookey, John (1995), Law & Society: Readings on the Social Study of Law, New York: W.W. Norton. Mertz, Elizabeth (2007), The Language of Law School: Learning to ‘Think Like a Lawyer’, Oxford: Oxford University Press. Monahan, John and Walker, Laurens (2006), Social Science in Law: Cases and Materials (6th edn), New York: Foundation Press. Riles, Annelise (2006), „Anthropology, Human Rights, and Legal Knowledge: Culture in the Iron Cage‟, American Anthropologist, 108, pp. 52–65. Sarat, Austin (2001), When the State Kills: Capital Punishment and the American Condition, Princeton, NJ: Princeton University Press. Sarat, Austin and Silbey, Susan (1988), „The Pull of the Policy Audience‟, Law & Policy 10, pp. 97– 168. Schieffelin, Bambi and Charlier Doucet, Rachelle Doucet (1994), „The “Real” Haitian Creole: Ideology, Metalinguistics, and Orthographic Choice‟, American Ethnologist, 21, pp. 176–200. Silverstein, Michael (2003), „Translation, Transduction, Transformation: Sliding “Glossando” on Thin Semiotic Ice‟, in Paula Rubel and Abraham Rosman (eds), Translating Cultures: Perspectives on Translation and Anthropology, Oxford: Berg, pp. 75–108. 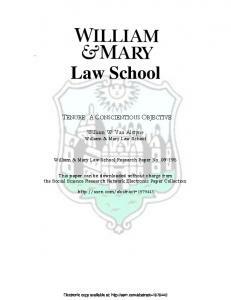 Sullivan, William M., Colby, Ann, Wegner, Judith Welch, Bond, Lloyd and Shulman, Lee S. (2007), Educating Lawyers: Preparation for the Profession of Law, Report for the Carnegie Foundation for the Advancement of Teaching, San Francisco: Jossey Bass. The Role of Social Science in Law White, James Boyd (1990), Justice as Translation: An Essay in Cultural and Legal Criticism, Chicago: University of Chicago Press. White, James Boyd (1992), „Translation as a Mode of Thought‟, Cornell Law Review, 11, pp. 1388–97. 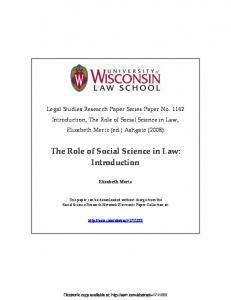 Yovel, Jonathan, and Mertz, Elizabeth (2004), „The Role of Social Science in Legal Decisions‟, Blackwell Companion to Law and Society, ed. Austin Sarat, Oxford, Blackwell, pp. 410–31. Cases Cited Brown v. Board of Education, 347 US 483 (1954). Gratz v. Bollinger, 539 US 244 (2003). Grutter v. Bollinger, 539 US 306 (2003). Lockhart v. McCree, 476 US 162 (1986). Muller v. Oregon, 208 US 412 (1908). Report "The Role of Social Science in Law: Introduction - SSRN papers"